Chronic Wasting Disease (CWD) is a neurological disease in deer, elk, moose and other members of the deer family, known as "cervids." The disease was first recognized in 1967 in captive mule deer in Colorado, and has since been documented in captive and free-ranging deer in states and two Canadian Provinces. The first case of CWD in Texas was discovered in 2012 in free-ranging mule deer in an isolated area of far West Texas. This disease presents numerous challenges for state wildlife agencies across North America. Of concern is the potential for decline within deer, elk, or other susceptible cervid populations. In addition, CWD could have indirect impacts on hunting, hunter participation, and economic benefits derived from big game hunting. In Texas, hunting is a $2.2 billion economic engine, supporting many rural towns across the state. Because eradication is thought to be impossible once CWD becomes established in a population, it is imperative that a sound CWD management program is established to reduce the severity of implications resulting from the disease. Of course, disease prevention is the best approach to protect cervid populations and prevent social and economic repercussions. Texas Parks and Wildlife Department (TPWD) and Texas Animal Health Commission (TAHC) have developed a cooperative CWD management plan to guide both agencies in addressing risks, developing management strategies, and protecting big game resources from CWD in captive or free-ranging cervid populations. Hunters who harvest mule deer, white-tailed deer, elk, red deer, or other CWD susceptible species within the Trans-Pecos, Panhandle, and South-Central Texas CWD Containment and Surveillance Zones are REQUIRED to bring their animals to a TPWD check station within 48 hours of harvest. TPWD urges voluntary sampling of hunter harvested deer outside of the CWD zones. Hunters interested in providing voluntary samples can contact their local TPWD biologist or bring their animals to any of the check stations located around the state. If bringing a quartered animal and the associated head to a check station, be sure to remove the head from the carcass 2 to 3 vertebrae below the head to ensure that the appropriate tissues for CWD testing are not damaged. Hunters should keep heads cool but not frozen. Rules also impose restriction of permitted live-deer movements to and from CWD zones. The rules are part of the state’s comprehensive CWD management plan to contain the disease to the areas where it is known to exist. Hunters are encouraged to report any “sick looking” deer, elk, or other CWD susceptible species while hunting in any CWD zone to TPWD. Contact information for the CWD zone check stations is found within the CWD section of the current Outdoor Annual and associated smart device application. To report a “sick looking” deer outside of a CWD zone, contact a TPWD wildlife biologist or Texas Game Warden. Carcass movement restrictions do not apply if the carcass will not be moved outside of a CWD zone. However, it is recommended to always properly dispose of unused carcass parts. For a map of the current distribution of CWD in North America, see the U.S. Geological Survey's Distribution of Chronic Wasting Disease in North America Sept 2018 webpage. Other states may have rules regarding CWD susceptible species carcasses entering their state. If you are from another state and hunting in Texas, be sure and check your home state’s CWD requirements. A map of states with CWD carcass entry restrictions is available on the CWD-INFO's webpage Carcass Transportation Regulations in the United States and Canada. The TPWD Outdoor Annual Chronic Wasting Disease webpage has detailed information on CWD including regulations, check station information, and carcass movement restrictions. Texas Animal Health Commission (TAHC) website has detailed information on their statewide mandatory testing requirements of exotic CWD susceptible species such as elk, red deer, sika, moose, reindeer, and any associated subspecies and hybrids. The first case of CWD in Texas was discovered in 2012 in free-ranging mule deer in the Hueco Mountains of far West Texas. The disease has since been detected in free-ranging mule deer, white-tailed deer, and elk in Dallam and Hartley counties, located in the northwest Panhandle. The first case of CWD in Texas white-tailed deer was found in a Medina County deer-breeding facility in 2015 as a result of routine disease monitoring. Increased testing requirements resulted in the detection of CWD in 4 additional deer breeding facilities and two release sites adjacent to the CWD-positive deer breeding facilities. CWD was also detected in a free-ranging white-tailed deer in Medina County in 2017 — for details and chronology of CWD detections in Texas, see CWD Positives in Texas webpage. With the discovery of CWD in a captive deer breeding facility in south-central Texas, the Texas Parks and Wildlife (TPW) Commission adopted comprehensive CWD Management Rules on June 20, 2016. Developed through a collaborative process that involved substantial stakeholder input, these rules address CWD management associated with permitting programs that authorize intensive deer management activities — for more information, read the Comprehensive CWD Management Rules PDF. Additional rules regarding CWD monitoring zones and carcass movement restrictions were adopted by the TPW Commission on August 25, 2016. As new cases of CWD were discovered in additional captive deer breeding facilities as well as free-ranging deer and elk in 2016/2017, the TPW Commission adopted modifications to the rules pertaining to live-deer movements into, within, and out of CWD Containment Zones and Surveillance Zones. Both sets of rules are intended to reduce the chances of spreading CWD and increasing the chances of detecting and containing CWD in areas where it might be present. The Chronic Wasting Disease Management Plan PDF will serve to guide TPWD and TAHC in addressing risks, developing management strategies, and protecting big game resources from CWD in captive or free-ranging cervid populations. Both agencies recognize the need for full cooperation and partnership among government agencies, conservation organizations, private landowners, hunters, and the general public should CWD occur in Texas. 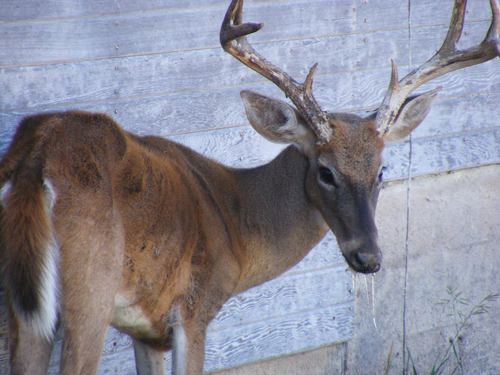 CWD is a reportable disease and TAHC has authority for reporting and tracking this disease in alternative livestock, which includes elk, red deer and sika deer. TPWD has regulatory authority for free-ranging white-tailed deer and mule deer, and both agencies share regulatory authority over captive deer held under the authority of Deer Breeder Permits. Minimize CWD risks to the wild and captive white-tailed deer, mule deer, and other susceptible species in Texas. Establish and maintain support for prudent CWD management with hunters, landowners, and other stakeholders. Minimize direct and indirect impacts of CWD to hunting, hunting related economies, and conservation in Texas. These individuals have been certified to collect postmortem CWD samples by Texas Animal Health Commission (TAHC) and have been provided materials and supplies to properly act as a TPWD sample collection station. Select a county to see certified CWD collectors.